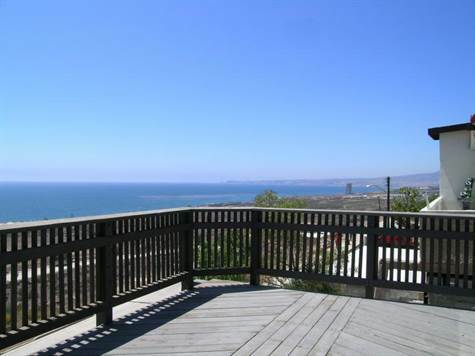 Medio Camino, Playas de Rosarito - Experience breathtaking oceanviews while enjoying the peace and quiet of this getaway nestled in the hills away from the traffic. Safety and Security abound in this gated and guarded community. This completely refurbished single level, 2 bedroom home is perfect for full time residency or use this as your weekend escape. Relax in the living area or proceed through the slding glass doors onto your expansive deck providing 180 degree view of the ocean and peninsulas. See the curvature of the earth from this marvelous vantage point. This home has been vastly improved with new deck, laundry room, roof, stucco, interior texture and paint, bathroom tile, plumbing and electrical fixtures, water heater and pila pump. Kitchen cabinets, counters, bedroom/linen closets have been installed. The 235m2 lot provides the option to add-on at house - level and/or below deck. This centrally located home is just 10 minutes to La Fonda Restaurant/Hotel, 5 minutes to sandy beach, 25 minutes south of Rosarito, and 25 minutes north of Ensenada. Come enjoy this rural lifestyle perfect for quiet walks or easy hikes with the ocean always in view.